Coconut Cream Poke Cake: a delicious coconut cream poke cake filled with a coconut cream filling and topped with toasted coconut. It’s a delicious creamy and flavorful cake perfect for a crowd. 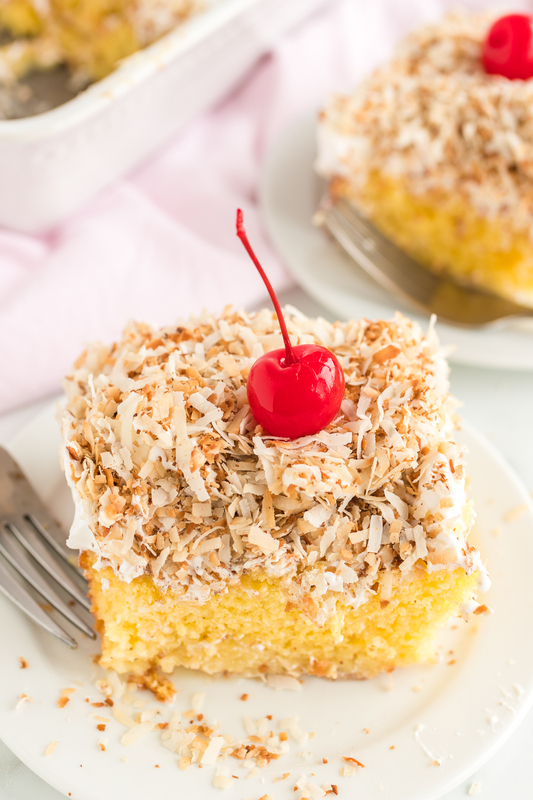 This coconut cream poke cake has no lack of flavor and it’s even better the next day! It’s filled with a creamy coconut filling that your pour onto the warm cake, letting all that filling soak into the cake. 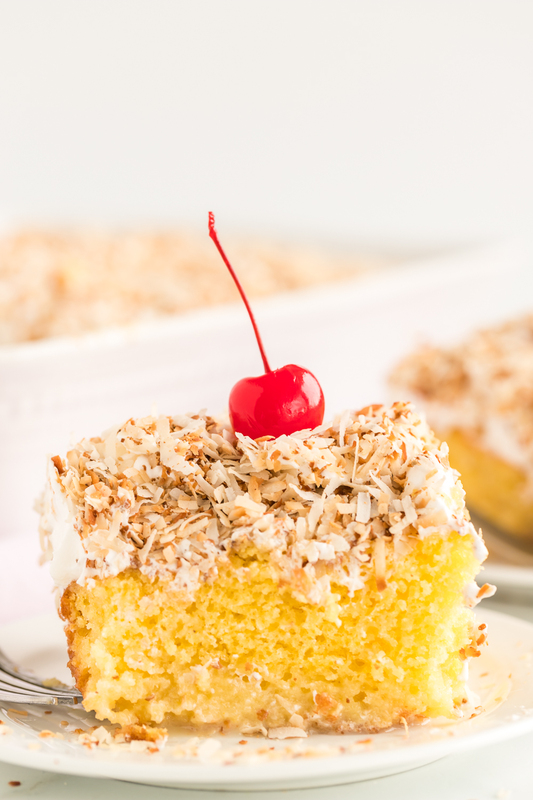 Top it with Cool Whip and some toasted coconut and it’s a delicious semi-homemade cake you can put together in less than one hour! 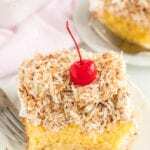 You only need a few simple ingredients to make this coconut cream poke cake and since this is a semi-homemade recipe it all starts with your favorite yellow cake mix. The rest of the ingredients you may already have in your pantry. 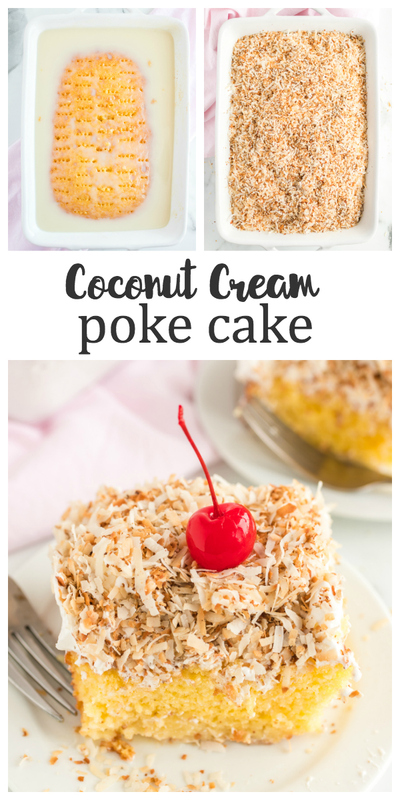 This coconut cream poke cake is so easy to put together! 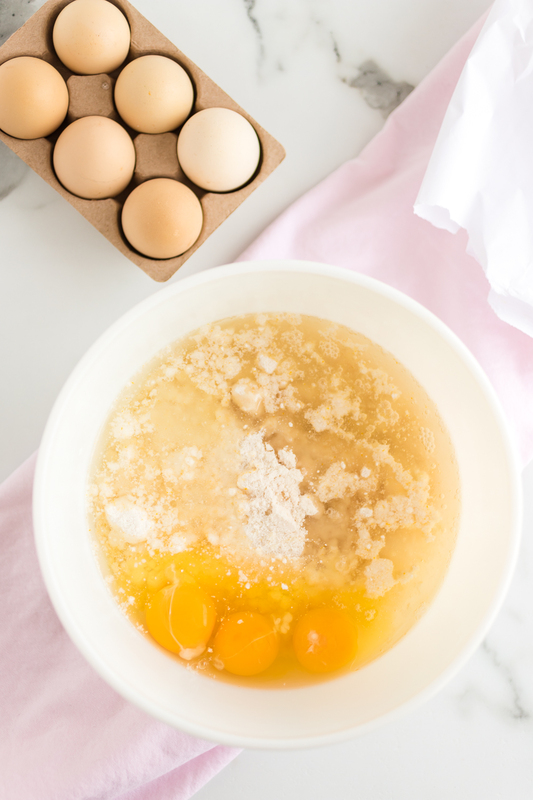 Start by making your yellow cake mix, following the directions on the box you bought. Once your cake has baked use a small fork to poke holes all over the cake. In a small bowl mix together the can of sweetened condensed milk and cream of coconut until blended together. Pour coconut mixture over the warm cake and allow to absorb into the cake. Once the cake has cooled completely top the cake with Cool Whip and toasted coconut. Place in refrigerator for 1-2 hours before serving. Top with maraschino cherries if desired. 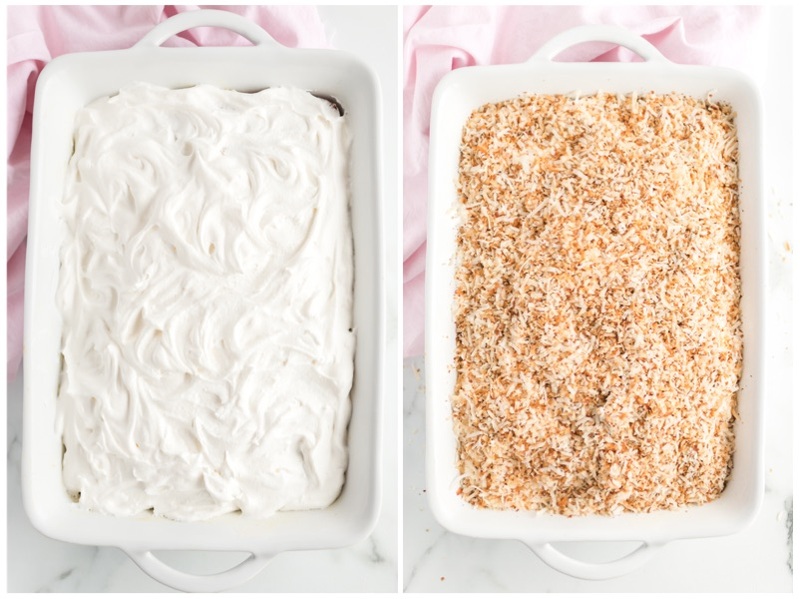 Can this coconut cream poke cake be prepared the night before? Yes! I actually prefer this recipe the following day after all the flavors have had the chance to blend together and fully dissolve into the cake. How to store store coconut cream poke cake? Once prepared store cake in the refrigerator for 1-2 hours before serving. When not serving, store in refrigerator for 3-4 days. Coconut Cream Poke Cake: a delicious coconut cream poke cake filled with a coconut cream filling and topped with toasted coconut. It's a delicious creamy and flavorful cake perfect for a crowd. Prepare cake mix as package directs. Remove from oven and using a fork, pork holes in entire cake. 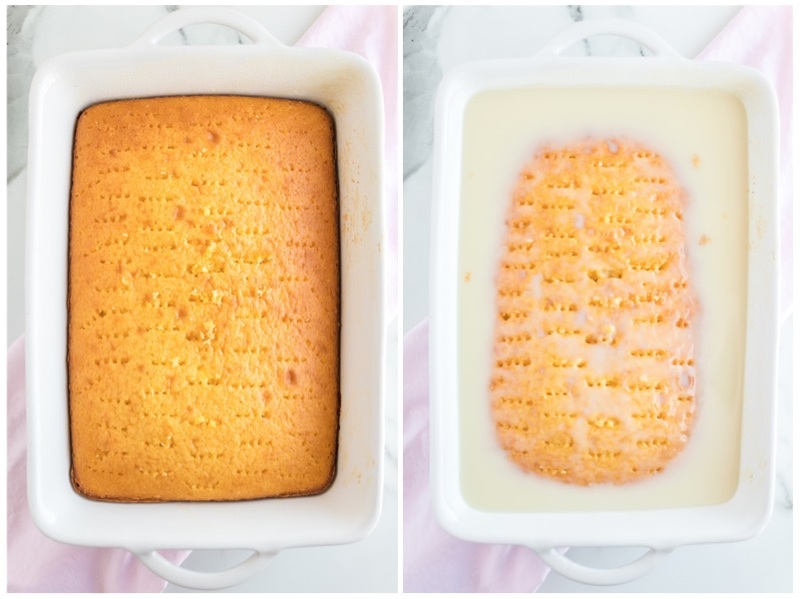 Mix condensed milk and cream of coconut; slowly pour over warm cake. Cool cake completely. Frost with cool whip topping; sprinkle with lightly toasted coconut. Cover and refrigerate until serving. Cut into squares.